If you need to do task automation based on the Redmond giant software, know and see how to install Microsoft PowerShell on Linux. PowerShell is a task management and automation management system developed by Microsoft. It includes a command-line shell and a framework for processing cmdlets. In addition, it is a very powerful object-oriented scripting language, with classes and methods, built on the .NET Framework. Originally, it was a Windows-only component, which was later opened and became multiplatform on August 18, 2016, making it available for both Linux and Mac OS. Powershell provides full access to WS-Management and Common Information Model (CIM) that enable remote Linux systems and network devices to be administered . In this tool, administrative tasks are basically performed by specific .NET classes called cmdlets. Similar to shell scripts in Linux, users can create scripts or executables by storing groups of cmdlets in files by following certain rules. These scripts can be used as stand-alone command-line utilities. In addition, it includes its own extensive console-based help (similar to man pages on the Linux command line) accessible through the Get-Help cmdlet. You can type get-help on the Powershell console. To complete, the local help content can be retrieved from the Internet through Update-Help cmdlet Update-Help on the console. 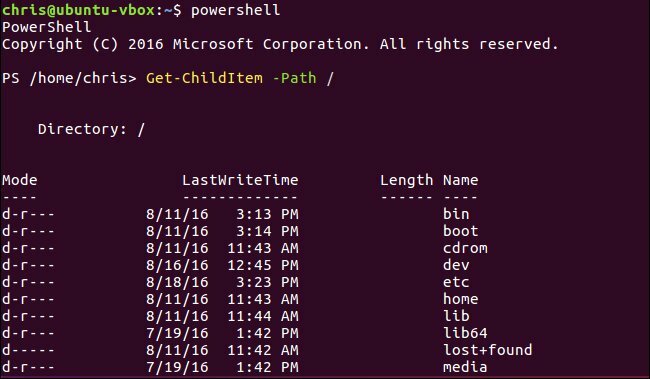 To install Microsoft PowerShell on Linux, simply use one of the procedures below to do the installation of Powershell on the most popular Linux distributions. Ready! Now, when you want to start the program, type powershellin a terminal (followed by the TAB key), or by clicking its icon or system application menu.